Car safety technology has come a long, long way. From the inception and implementation of early ABS systems through seatbelts becoming a legal requirement, to the likes of crumple zones, airbags and stability control, things which seem novel at their inception become commonplace as time wears on. All cars are now fitted with ABS: it’s a legal requirement. But in 1978, when ABS was first introduced into series production, it was limited to just two models – the Mercedes Benz S-Class and the BMW 7-series. At the time it might have been radical to think such technology would be mandatory on all cars. So what of the future? What can we expect to see as standard safety equipment in the years to come? We recently visited the Bosch proving ground in Germany to be briefed on the future of automotive safety, and to sample first-hand some of the latest vehicle safety equipment. Bosch introduced the first electric airbag control system in 1981, and introduced the ESP electronic stability program in 1995. But not content with resting on their laurels, they continue to hone current technology and develop new equipment, with the aim of cutting the current 1.3 million road deaths that occur worldwide every year. 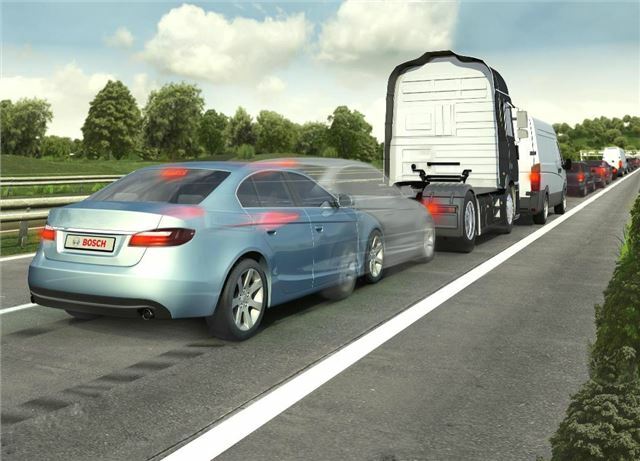 The latest equipment on offer from Bosch is based on the use of video, radar and ultrasound, coupled to systems like lane departure warning and collision mitigating braking systems. It’s all been in development for quite a while, and some high end models are fitted with the technology already, such as the Audi A8 and Volvo S60. It’s very clever stuff. We’ve driven cars with such technology before, but testing it out on the open road with pedestrians and other drivers as guinea pigs is pretty dangerous and stupid. Having the opportunity to test it for real, in a controlled environment, makes it all the more apparent how useful and how important it is to safety. At the Bosch proving ground near Frankfurt we got behind the wheel of a development model fitted with a collision mitigating braking system. The test involved accelerating to 50mph and then driving at a cardboard cut-out Audi moving at about 25mph. The technician told us to ignore the brakes and keep heading for the ‘car’ in front. As the distance between the car we were driving and the car in front became critical, a buzzer sounded – but we ignored that too. Next, the brakes apply themselves gently to really get your attention, at which point we applied a small amount of braking force. The car then figures out the maximum safe braking force possible and applies it on your behalf, even if you only dab the brakes. The result is a smooth, straight stop with no skidding, and no collision with the cardboard car. It’s amazing how well the system works, and it was far more effective at stopping safely than we would have been without it. It is available now in higher end models, but Bosch has continued to develop, downsize and reduce the costs of this technology in an effort to make fitting it to smaller vehicles more feasible. It’s the same story with other video, radar and ultrasound based systems, like blind-spot warning, and even night vision. Bosch is introducing new, inexpensive sensors to the market which will allow the makers of smaller cars to reap the safety benefits without prohibitive costs. It’s estimated that by 2015, 15% of all new vehicles will be fitted with a collision mitigating braking system thanks to this reduced cost. The next stage in safety is to allow cars to self drive in tightly packed traffic, such as in town. Eventually that system will extend to motorways, and with inter-car communication systems, eventually vehicles will be warned of stationary traffic around bends and over crests well before the driver can see them. The benefits of these technologies are more than just safety related. Werner Struth, President of Chassis Systems Control at Bosch, told us that if low-speed emergency braking systems were fitted to all cars as many as 500,000 minor accidents could be prevented annually in Germany alone, saving 330 million Euros and reducing insurance premiums substantially. When you consider the technology that was once novel and is now standard equipment, it’s easy to foresee a future in which all new cars are fitted with automatic emergency brakes, night vision and automatic driving in town. Hopefully, with ever more cars on the road and insurance costs rising, that future isn’t too far away.